We make having your car serviced or repaired so convenient! Read what our customers say about our service by following the link below. Read about our company and why we're making a big name for ourselves in the area. Get in touch with us via the phone or send us an email by clicking below. If you are anywhere in the Nottingham area and are looking for a reliable, experienced and trustworthy car and van servicing and repair company then you need look no further than us. What's more, with us, you get the added convenience of us coming to you. It can be a daunting process to organise your day around your car having to go into the garage for repairs or servicing. Why can't the garage come to you instead? Across Nottingham, that's exactly what we offer - a fully functional and operational mobile garage offering you absolutely unbeatable convenience. Whether you have a small car or a large work van which you need servicing or repaired, you can rest assured that we have the experience and the ability to provide you with absolutely first class service. 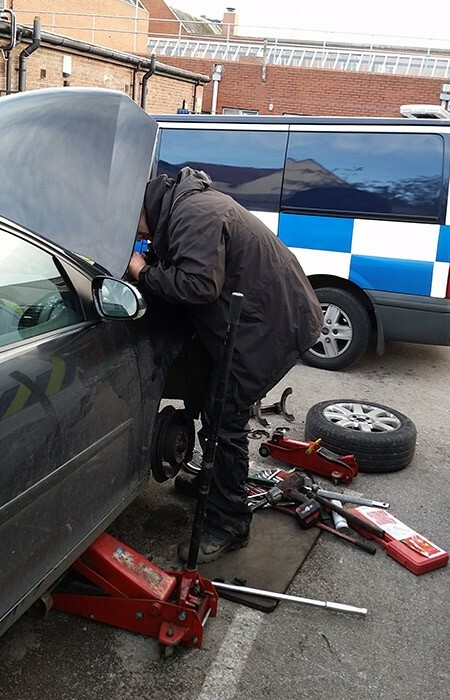 We have extensive experience in providing a wide range of cars and commercial vehicles across Nottingham with professional quality repairs, servicing and maintenance which means we are able to offer you unmatched peace of mind. As our many reviews will testify, our workmanship is first class, meaning you spend less time worrying about repairs and more time on the road. No matter whether your car is five months old or fifty years old, we will be able to provide you with the same level of world class service to keep your wheels turning smoothly. We are able to cater for a wide range of vehicles, whether we use modern diagnostic tools or good old fashioned 'get your hands dirty' classic servicing and repairs. Call today and let us take the stress out of your car or van's servicing and repair! If you're in Nottingham and would like the hassle taking out of your car servicing, pick up the phone and call us now on 0115 815 7995. Car wouldn't start today. Turned on ignition Nothing. Rang Zak and he was at my home within the hour. After examination it was found that a new battery was needed. Zak had one in his vehicle and he fitted it immediately. He then checked the alternator etc to make sure nothing else was amiss. Within 15 minutes of his arrival my car was up and running. An excellent. I would not hesitate to use him again if the need arose. Well done.